Welcome to our List of Fire Emblem Heroes Skills available in the game. We will explain the different types and what are the Best Skills In Fire Emblem Heroes. What Are Fire Emblem Heroes Skills? Fire Emblem Heroes Skills are unique abilities that your characters can learn, these abilities can inflict more damage to enemy units and are mostly triggered automatically. You can learn these skills by consuming SP (Skill Points). These Points are earned from Leveling UP and defeating enemies. 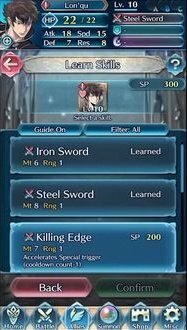 You Heroes can learn these abilities by consuming SP (Fire Emblem Heroes Skill Points). These Points are earned from Leveling UP and defeating enemies. Weapon Skill Determines the Power and Range of normal attacks. These are the most frequently used moves out of the types. Falchion 16 1 Effective against dragons. At the start of every third turn, unit recovers 10 HP. Sword of Seals 16 1 Bestows Def+2 and Res+2 upon its wielder. Durandal 16 1 Attack+5 if initiating attack. Raijinto 16 1 Enables counterattack regardless of distance if this unit is attacked. Armads 16 1 Unit makes a guaranteed follow-up attack when attacked at HP ≥ 80%. Binding Blade 16 1 Grants Def/Res+2 when this unit is attacked. Sol Katti 16 1 If wielder initiates attack at HP ≤ 50%, any follow-up occurs immediately. Hauteclere 16 1 Accelerates Special trigger (cooldown count-1). Fensalir 16 1 Inflicts Atk-4 on foes within 2 spaces through their next actions at the start of each turn. Excalibur 14 2 Effective against flying units. Parthia 14 2 Effective against flying units. Grants Res+4 during combat if initiating attack. Brynhildr 14 2 If unit initiates attack, restricts foe’s next-turn movement to 1 space or less. Fujin Yumi 14 2 Effective against flying units. Unit can pass though foes if own HP ≥ 50%. Lauer Blade+ 13 2 Slows Special trigger (cooldown count+1). Gronnblade+ 13 2 Slows Special trigger (cooldown count+1). Adds total bonuses on unit to damage dealt. Rauorblade+ 13 2 Slows Special Trigger (cooldown count +1). Adds total bonuses on unit to damage dealt. Dark Breath+ 13 1 After this unit attacks, foes within 2 spaces of target suffer Atk/Spd-5 through their next actions. Light Breath+ 13 1 Grants adjacent allies Def/Res+4 through their next actions after any combat this unit initiates. Blárblade+ 13 2 Slows Special trigger (cooldown count+1). Adds total bonuses on unit to damage dealt. Silver Bow+ 13 2 Effective against flying units. Heavy Spear+ 12 1 Effective against armored units. Emerald Axe+ 12 1 Gives Atk+20% if weapon-triangle advantage, Atk-20% if disadvantage. Emerald Axe 12 1 Gives Atk+20% if weapon-triangle advantage, Atk-20% if disadvantage. Armorslayer+ 12 1 Effective against armored units. Sapphire Lance+ 12 1 Gives Atk+20% if weapon-triangle advantage, Atk-20% if disadvantge. Hammer+ 12 1 Effective against armored units. Ruby Sword+ 12 1 Gives Atk+20% if weapon-triangle advantage, Atk-20% if disadvantage. Killer Axe+ 11 1 Accelerates Special trigger (cooldown count-1). Blárraven+ 11 2 Grants weapon advantage vs. colorless foes. Killer Lance+ 11 1 Accelerates Special trigger (cooldown count-1). Killing Edge 11 1 Accelerates Special trigger (cooldown count-1). Hidden Killer Bow+ 11 2 If enemy wepon type is Hidden, you can double attack and enemy can’t. Lightning Breath+ 11 1 Enables counterattack regardless of attacker’s range. Slows Special trigger (cooldown count+1). Gronnraven+ 11 1 Grants weapon advantage vs. colorless foes. Killing Edge+ 11 1 Accelerates Special trigger (cooldown count-1). Rauðrraven 11 2 Grants weapon advantage vs. colorless foes. Rauðrraven+ 11 2 Grants weapon advantage vs. colorless foes. Assassin’s Bow+ 11 2 Effective against fliers. If target has a dagger, it can’t make a follow-up attack and this unit will. Silver Dagger+ 10 2 After combat, inflicts Def/Res-7 on foe through its next action. Rauðrwolf+ 10 2 Effective against cavalry units. Silver Bow 9 2 Effective against flying units. Killer Bow+ 9 2 Effective against flying units. Accelerates Special trigger (cooldown count-1). Lauer Blade 9 2 Slows Special trigger (cooldown count+1). Gronnblade 9 2 Slows Special trigger (cooldown count+1). Adds total bonuses on unit to damage dealt. 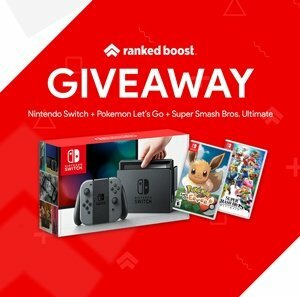 Rauorblade 9 2 Slows Special Trigger (cooldown count +1). Adds total bonuses on unit to damage dealt. Dark Breath 9 1 After this unit attacks, foes within 2 spaces of target suffer Atk/Spd-5 through their next actions. Light Breath 9 1 Grants adjacent allies Def/Res+4 through their next actions after any combat this unit initiates. Blárblade 9 2 Slows Special trigger (cooldown count+1). Adds total bonuses on unit to damage dealt. Smoke Dagger+ 9 2 After combat, inflicts Def/Res-6 on foes within 2 spaces of target through their next actions. Heavy Spear 8 1 Effective against armored units. Brave Axe+ 8 1 Spd-5. Attack twice when initiating combat. Armorslayer 8 1 Effective against armored units. Brave Lance+ 8 1 Spd-5. Attack twice when initiating combat. Sapphire Lance 8 1 Gives Atk+20% if weapon-triangle advantage, Atk-20% if disadvantge. Hammer 8 1 Effective against armored units. Brave Sword+ 8 1 Spd-5. Attack twice when initiating combat. Ruby Sword 8 1 Gives Atk+20% if weapon-triangle advantage, Atk-20% if disadvantage. Killer Axe 7 1 Accelerates Special trigger (cooldown count-1). Silver Dagger 7 2 After battle, inflicts Def/Res-5 on foe through its next action. Blárraven 7 2 Grants weapon advantage vs. colorless foes. Panic 7 2 After combat, bonuses on targeted foe become penalties through its next action. Killer Lance 7 1 Accelerates Special trigger (cooldown count-1). Rogue Dagger+ 7 2 After combat, inflicts Def/Res-5 on foe through its next action. Grants unit Def/Res+5 for 1 turn. Lightning Breath 7 1 Enables counterattack regardless of attacker’s range. Slows Special trigger (cooldown count+1). Gronnraven 7 2 Grants weapon advantage vs. colorless foes. Assassin’s Bow 7 2 Effective against fliers. If target has a dagger, it can’t make a follow-up attack and this unit will. Steel Bow 6 2 Effective against flying units. Rauðrwolf 6 2 Effective against cavalry units. Smoke Dagger 6 2 After combat, inflicts Def/Res-4 on foes within 2 spaces of target through their next actions. Brave Sword 5 1 Spd-5. Attack twice when initiating combat. Brave Lance 5 1 Spd-5. Attack twice when initiating combat. Steel Dagger 5 2 After combat, inflicts Def/Res-3 on foe through its next action. Killer Bow 5 2 Effective against flying units. Accelerates Special trigger (cooldown count-1). Fear 5 2 After combat, inflicts Atk-6 on targeted foe through its next action. Brave Axe 5 1 Spd-5. Attack twice when initiating combat. Poison Dagger+ 5 2 Effective against infantry units. Infantry foes suffer Def/Res-6 after combat through their next actions. Slow 5 2 After any combat, inflicts Spd-6 on foe through its next action. Iron Bow 4 2 Effective against flying units. Rogue Dagger 4 2 After combat, inflicts Def/Res-3 on for through its next action. Grants unit Def/Res+3 for 1 turn. Absorb 4 2 Recover 50% of damage dealt. Iron Dagger 3 2 After combat, inflicts Def/Res-3 on foe through its next action. Pane 3 2 After battle, deal 10 damage to the enemy. Pain 3 2 Inflicts 10 damage on targeted foe after combat. Poison Dagger 2 2 Effective against infantry units. Infantry foes suffer Def/Res-4 after combat through their next actions. 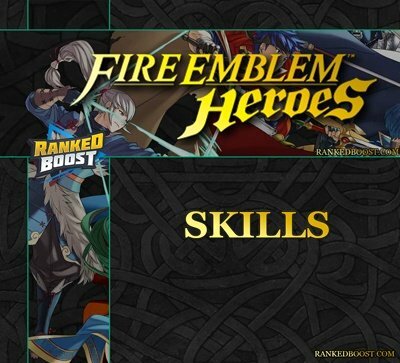 There are three kinds of passive Fire Emblem Heroes skills that can be equipped on your character A, B and C. Each Fire Emblem Character can only hold a total of 3 Passives. Wings of Mercy 3 Enables unit to warp adjacent to any ally with HP ≤ 50%. Wings of Mercy 2 Enables unit to warp adjacent to any ally with HP ≤ 40%. Wings of Mercy 1 Enables unit to warp adjacent to any ally with HP ≤ 30%. Warding Blow 3 Grants Res+6 during combat if unit initiates the attack. Warding Blow 2 Grants Res+4 during combat if unit initiates the attack. Warding Blow 1 Grants Res+2 during combat if unit initiates the attack. Ward Fliers Grants flying allies within 2 spaces Def/Res+4 during combat. Ward Cavalry Grants cavalry allies within 2 spaces Def/Res+4 during combat. Ward Armor Grants armored allies within 2 spaces Def/Res+4 during combat. Triangle Adept 3 Gives Atk+20% if weapon-triangle advantage, Atk-20% if disadvantage. Triangle Adept 2 Gives Atk+15% if weapon-triangle advantage, Atk-15% if disadvantage. Triangle Adept 1 Gives Atk+10% if weapon-triangle advantage, Atk-10% if disadvantage. Threaten Spd 3 Inflicts Spd-5 on foes within 2 spaces through their next actions at the start of each turn. Threaten Spd 2 Inflicts Spd-4 on foes within 2 spaces through their next actions at the start of each turn. Threaten Spd 1 Inflicts Spd-3 on foes within 2 spaces through their next actions at the start of each turn. Threaten Res 3 Inflicts Res-5 on foes within 2 spaces through their next actions at the start of each turn. Threaten Res 2 Inflicts Res-4 on foes within 2 spaces through their next actions at the start of each turn. Threaten Res 1 Inflicts Res-3 on foes within 2 spaces through their next actions at the start of each turn. Threaten Atk 3 Inflicts Atk-5 on foes within 2 spaces through their next actions at the start of each turn. Threaten Atk 2 Inflicts Atk-4 on foes within 2 spaces through their next actions at the start of each turn. Threaten Atk 1 Inflicts Atk-3 on foes within 2 spaces through their next actions at the start of each turn. Swordbreaker 3 If unit’s HP ≥ 50% in combat against a sword user, unit makes a follow-up attack and foe cannot. Swordbreaker 2 If unit’s HP ≥ 70% in combat against a sword user, unit makes a follow-up attack and foe cannot. Swordbreaker 1 If unit’s HP ≥ 90% in combat against a sword user, unit makes a follow-up attack and foe cannot. Svalinn Shield Neutralizes “effective against” bonuses. Spur Spd 3 Grants adjacent allies Spd+4 during combat. Spur Spd 2 Grants adjacent allies Spd+3 during combat. Spur Spd 1 Grants adjacent allies Spd+2 during combat. Spur Def 3 Grants adjacent allies Def+4 during combat. Spur Def 2 Grants adjacent allies Def+3 during combat. Spur Def 1 Grants adjacent allies Def+2 during combat. Spur Atk 3 Grants adjacent allies Atk+4 during combat. Spur Atk 2 Grants adjacent allies Atk+3 during combat. Spur Atk 1 Grants adjacent allies Atk+2 during combat. Seal Spd 3 After combat, foe suffers Spd-7 through its next action. Seal Spd 2 After combat, foe suffers Spd-5 through its next action. Seal Spd 1 After combat, foe suffers Spd-3 through its next action. Seal Res 3 After combat, foe suffers Res-7 through its next action. Seal Res 2 After combat, foe suffers Res-5 through its next action. Seal Res 1 After combat, foe suffers Res-3 through its next action. Seal Def 3 After combat, foe suffers Def -7 through its next action. Seal Def 2 After combat, foe suffers Def -5 through its next action. Seal Def 1 After combat, foe suffers Def -3 through its next action. Seal Atk 3 After combat, foe suffers Atk-7 through its next action. Seal Atk 2 After combat, foe suffers Atk-5 through its next action. Seal Atk 1 After combat, foe suffers Atk-3 through its next action. Savage Blow 3 If unit initiates attack, foes within 2 spaces of target take 7 damage after combat. Savage Blow 2 If unit initiates attack, foes within 2 spaces of target take 5 damage after combat. Savage Blow 1 If unit initiates attack, foes within 2 spaces of target take 3 damage after combat. Renewal 3 At the start of every second turn, restores 10 HP. Renewal 2 At the start of every third turn, restores 10 HP. Renewal 1 At the start of every fourth turn, restores 10 HP. R Tomebreaker 3 If unit’s HP ≥ 50% in combat against a red tome user, unit makes a follow-up attack and foe cannot. R Tomebreaker 2 If unit’s HP ≥ 70% in combat against a red tome user, unit makes a follow-up attack and foe cannot. R Tomebreaker 1 If unit’s HP ≥ 90% in combat against a red tome user, unit makes a follow-up attack and foe cannot. Quick Riposte 3 Unit automatically makes a follow-up attack if attacked at HP ≥ 70%. Quick Riposte 2 Unit automatically makes a follow-up attack if attacked at HP ≥ 80%. Quick Riposte 1 Unit automatically makes a follow-up attack if attacked at HP ≥ 90%. Poison Strike 3 Inflicts 10 damage to foe after any combat this unit initiates. Poison Strike 2 Inflicts 7 damage to foe after any combat this unit initiates. Poison Strike 1 Inflicts 4 damage to foe after any combat this unit initiates. Pass 3 Unit can pass through foes if its own HP ≥ 25%. Pass 2 Unit can pass through foes if its own HP ≥ 50%. Pass 1 Unit can pass through foes if its own HP ≥ 75%. Lunge If unit initiates attack, after combat, unit and targeted foe swap places. Life and Death 3 Grants Atk/Spd+5. Inflicts Def/Res-5. Life and Death 2 Grants Atk/Spd+4. Inflicts Def/Res-4. Life and Death 1 Grants Atk/Spd+3. Inflicts Def/Res-3. Lancebreaker 3 If unit’s HP > 50% in combat against a lance user, unit makes a follow-up attack and foe cannot. Lancebreaker 2 If unit’s HP > 70% in combat against a lance user, unit makes a follow-up attack and foe cannot. Lancebreaker 1 If unit’s HP > 90% in combat against a lance user, unit makes a follow-up attack and foe cannot. HP +5 Grants +5 to max HP. HP +4 Grants +4 to max HP. HP +3 Grants +3 to max HP. Hone Spd 3 Grants adjacent allies Spd+5 through their next actions at the start of each turn. Hone Spd 2 Grants adjacent allies Spd+3 through their next actions at the start of each turn. Hone Spd 1 Grants adjacent allies Spd+2 through their next actions at the start of each turn. Hone Fliers Grants adjacent flying allies Atk/Spd+6 through their next actions at the start of each turn. Hone Calvary Grants adjacent cavalry allies Atk/Spd+6 through their next actions at the start of each turn. Hone Atk 3 Grants adjacent allies Atk+4 through their next actions at the start of each turn. Hone Atk 2 Grants adjacent allies Atk+3 through their next actions at the start of each turn. Hone Atk 1 Grants adjacent allies Atk+2 through their next actions at the start of each turn. Goad Armor Grants armored allies within 2 spaces Spd/Atk+4 during combat. G Tomebreaker 3 If unit’s HP ≥ 50% in combat against a green tome user, unit makes a follow-up attack and foe cannot. G Tomebreaker 2 If unit’s HP ≥ 70% in combat against a green tome user, unit makes a follow-up attack and foe cannot. G Tomebreaker 1 If unit’s HP ≥ 90% in combat against a green tome user, unit makes a follow-up attack and foe cannot. Fury 3 Grants Atk/Spd/Def/Res+3. Unit takes 6 damage after combat. Fury 2 Grants Atk/Spd/Def/Res+2. Unit takes 4 damage after combat. Fury 1 Push adjacent ally 2 spaces farther away. Fortify Res 3 Grants adajacent allies Res+4 through their next actions at the start of each turn. Fortify Res 2 Grants adajacent allies Res+3 through their next actions at the start of each turn. Fortify Res 1 Grants adajacent allies Res+2 through their next actions at the start of each turn. Fortify Fliers Grants adjacent flying allies Def/Res+6 through their next actions at the start of each turn. Fortify Def 3 Grants adjacent allies Def+4 through their next actions at the start of each turn. Fortify Def 2 Grants adjacent allies Def+3 through their next actions at the start of each turn. Fortify Def 1 Grants adjacent allies Def+2 through their next actions at the start of each turn. Fortify Cavalry Grants adjacent cavalry allies Def/Res+6 through their next actions at the start of each turn. Fortify Armor Grants adjacent armored allies Def/Res+6 through their next actions at the start of each turn. Escape Route 3 Enables unit whose own HP ≤ 50% to wrap adjacent to any ally. Escape Route 2 Enables unit whose own HP ≤ 40% to wrap adjacent to any ally. Escape Route 1 Enables unit whose own HP ≤ 30% to wrap adjacent to any ally. Drag Back If unit initiates attack, the unit moves 1 space away after combat. Foe moves into unit’s previous space. Distant Counter Enables unit to counterattack regardless of distance to attacker. Desperation 3 If unit initiates combat with HP ≤ 75%, follow-up attacks occur immediately after unit’s attack. Desperation 2 If unit initiates combat with HP ≤ 50%, follow-up attacks occur immediately after unit’s attack. Desperation 1 If unit initiates combat with HP ≤ 25%, follow-up attacks occur immediately after unit’s attack. Defiant Spd 3 Grants Spd+7 at start of turn if unit’s HP ≤ 50%. Defiant Spd 2 Grants Spd+5 at start of turn if unit’s HP ≤ 50%. Defiant Spd 1 Grants Spd+3 at start of turn if unit’s HP ≤ 50%. Defiant Res 3 Grants Res+7 at start of turn if unit’s HP ≤ 50%. Defiant Res 2 Grants Res+5 at start of turn if unit’s HP ≤ 50%. Defiant Res 1 Grants Res+3 at start of turn if unit’s HP ≤ 50%. Death Blow 3 Grants Atk+6 if unit initiates combat. Death Blow 2 Grants Atk+4 if unit initiates combat. Death Blow 1 Grants Atk+2 if unit initiates combat. Darting Blow 3 Grants Spd+6 during combat if unit initiates the attack. Darting Blow 2 Grants Spd+4 during combat if unit initiates the attack. Darting Blow 1 Grants Spd+2 during combat if unit initiates the attack. Daggerbreaker 3 If unit’s HP ≥ 50% in combat against a dagger user, unit makes a follow-up attack and foe cannot. Daggerbreaker 2 If unit’s HP ≥ 70% in combat against a dagger user, unit makes a follow-up attack and foe cannot. Daggerbreaker 1 If unit’s HP ≥ 90% in combat against a dagger user, unit makes a follow-up attack and foe cannot. Close Counter Enables unit to counterattack regardless of distance to attacker. Breath of Life 3 If unit initiates attack, adjacent allies recover 7 HP after combat. Breath of Life 2 If unit initiates attack, adjacent allies recover 5 HP after combat. Breath of Life 1 If unit initiates attack, adjacent allies recover 3 HP after combat. Brash Assault 3 Unit automatically makes a follow-up when at HP < 50% and attacking a foe that can counter. Brash Assault 2 Unit automatically makes a follow-up when at HP < 40% and attacking a foe that can counter. Brash Assault 1 Unit automatically makes a follow-up when at HP < 30% and attacking a foe that can counter. Bowbreaker 3 If unit’s HP ≥ 50% in combat against a bow user, unit makes a follow-up attack and foe cannot. Bowbreaker 2 If unit’s HP ≥ 70% in combat against a bow user, unit makes a follow-up attack and foe cannot. Bowbreaker 1 If unit’s HP ≥ 90% in combat against a bow user, unit makes a follow-up attack and foe cannot. Axebreaker 3 If unit’s HP ≥ 50% in combat against an axe user, unit makes a follow-up attack and the foe cannot. Axebreaker 2 If unit’s HP ≥ 70% in combat against an axe user, unit makes a follow-up attack and the foe cannot. Axebreaker 1 If unit’s HP ≥ 90% in combat against an axe user, unit makes a follow-up attack and the foe cannot. Armored Blow 3 Grants Def+6 druing combat if unit initiates the attack. Armored Blow 2 Grants Def+4 druing combat if unit initiates the attack. Armored Blow 1 Grants Def+2 druing combat if unit initiates the attack. These Fire Emblem Heroes Skills unleash attacks that are stronger than normal attacks and can vary in multiple ranges. Vengance Grants bonus to damage dealt equal to 50% of damage suffered. Swift-Winds Balm When healing an ally with a staff, grants all allies Spd+4 for 1 turn. Solid-Earth Balm When healing an ally with a staff, grants all allies Def+4 for 1 turn. Rising Wind Before combat this unit initiates, foes in an area near target take damage equal to (unit’s Atk minus foe’s Def or Res). Rising Light Before combat this unit initiates, foes in an area near target take damage equal to (unit’s Atk minus foe’s Def or Res). Rising Flame Before combat this unit initiates, foes in an area near target take damage equal to (unit’s Atk minus foe’s Def or Res). Retribution Grants bonus to damage dealt equal to 30% of damage suffered. Reprisal Grants bonus to damage dealt equal to 30% of damage suffered. Pavise Reduces damage inflicted by attacks from adjacent foes by 50%. Moonbow Resolve combat as if foe suffered Def/Res-30%. Miracle If HP > 1, survive a lethal attack with 1 HP remaining. Imbue When healing an ally with a staff, increases recovered HP by 10. Ignis Boosts damage dealt by 80% of unit’s DEF. Iceberg Boosts damage dealt by 50% of unit’s Res. Holy Vestments Reduces damage inflicted by attacks from foes 2 spaces away by 30%. Heavenly Light When healing an ally with a staff, all other allies recover 10 HP. Growing Wind Before combat this unit initiates, foes in a wide area around the target take damage equal to (unit’s Atk minus foe’s Def or Res). Growing Flame Before combat this unit initiates, foes in a wide area around target take damage equal to (unit’s Atk minus foe’s Def or Res). Glimmer Grants 50% to damage dealt. Escutcheon Inflicts Atk-5 on foes within 2 spaces through their next actions at the start of each turn. Dragon Fang Grants +50% to Atk. Buckler Reduces damage inflicted by attacks from adjacent foes by 30%. Blazing Wind Before combat this unit initiates, foes in an area near target take damage equal to 1.5x (unit’s Atk minus foe’s Def or Res). Blazing Light Before combat this unit initiates, foes in an area near target take damage equal to 1.5 x (unit’s Atk minus foe’s Def or Res). take damage equal to 1.5 x (unit’s ATK minus foe’s DEF or RES). Aether Resolve combat as if foe sufferd Def/Res-50%. Unit recovers HP=half damage dealt. Aegis Reduces damage inflicted by attacks from foes 2 spaces away by 50%. Commands are supplementary action Fire Emblem Heroes skills other than attacks that do damage. These tend to be Stat Buffing effects and Recovery/Ressurection, there are also those that weaken the enemy units stats. Swap Swap places with an adjacent ally. Smite Push adjacent ally 2 spaces farther away. Shove Push adjacent ally 1 space farther away. Reposition Moves adjacent ally to opposite side of unit. Rehabilitate Restores 7 HP or more the further below 50% the target’s HP is. Reconcile Restores 7 HP each to target and this unit. Reciprocal Aid Swap HP with adjacent ally (neither unit can go above their max HP). Rally Resistance Grants Res+4 to an adjacent ally until the end of the turn. Rally Defense Grants Def+4 to an adjacent ally until the end of the turn. Rally Attack Grants Atk+4 to an adjacent ally until the end of the turn. Pivot Unit moves to opposite side of adjacent ally. Physic Restores 8 HP to target and all allies within 2 spaces of target. Martyr Restores HP=7+this unit’s suffered damage. Unit heals HP=half suffered damge. Slows Special trigger (cooldown count+1). Harsh Command Converts penalties on target into bonuses. Draw Back Unit moves 1 space away from target ally, who moves to unit’s former position. Dance Makes the target unit active.